When Warner Bros hired Ben Affleck to play Batman in Batman v Superman: Dawn of Justice, they weren’t getting your average actor. Having co-written Good Will Hunting and directed Gone Baby Gone, The Town and Argo, Affleck has proved his talent behind the camera many times, so you can bet this he gave his own two cents on other creative aspects of the movie. In fact, according to one report, Affleck made changes to the script during production, and while in the Batsuit apparently. Holy rewrites, Batman! 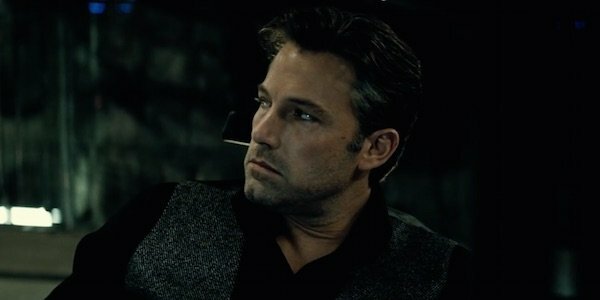 [Affleck] would go into wardrobe and get all suited up for the day in his Batman suit. Then he would sit around reworking the script. Ben wasn’t thrilled with it, and would find himself on multiple occasions fixing it the day of. The image of Affleck in the Batsuit crossing out lines with a pen is certainly an interesting mental image, and I would hope that someone on set got a picture of that to post once the movie’s out. If you’ve read about Affleck, you know he’s been a Batman fan for decades, so if there’s anyone who’s competent enough to make changes to such a project, it’s him. That said, considering that Affleck was the one who recommended Argo scribe Chris Terrio to rewrite Batman v Superman: Dawn of Justice, it’s hard to imagine him changing the writing of someone he worked so closely with not that long ago. Plus, major script changes don’t usually happen in the middle of shooting. However, if these were simply small adjustments, like a few lines of dialogue, then it’s plausible that Affleck would have gone through that script, after running the changes by director Zack Snyder, of course. Many of you will remember that Batman v Superman: Dawn of Justice was originally supposed to come out last July, but it was eventually moved in order for the filmmakers to "fully realize their vision." So even if Affleck’s own reported changes weren’t that big, the March blockbuster definitely went through some retooling during its long production. Following Batman v Superman: Dawn of Justice, Affleck will officially reprise the Dark Knight in Suicide Squad, Justice League: Part One and Justice League: Part Two, but there is also a new solo Batman movie in development. Not only have there been multiple rumors about Affleck directing that latter movie, but it was also reported last summer that he’s co-writing the script with DC’s Chief Creative Officer Geoff Johns. If this news ends up being verified, then we’ll get to see what Affleck’s vision for Bruce Wayne's adventuring on his own looks like. We’ll see Affleck in action as the DCEU’s Caped Crusader when Batman v Superman: Dawn of Justice arrives in theaters on March 25.